Be the first to share your favorite memory, photo or story of Grace Letha. This memorial page is dedicated for family, friends and future generations to celebrate the life of their loved one. GABLE – Grace Letha Gipe Elson, 95, widow of William Owens Elson, died Tuesday, January 29, 2019, at her home. Born November 25, 1923, in Fort Collins, Colorado, she was a daughter of the late Guilford Gipe and the late Dopha Alzada Hamill Gipe. She graduated from C.K. McClatchy High School and a secretarial college in Sacramento, California, and went on to work as a secretary at Mather Field for the Army Air Corps during WWII. There she met and married PFC William Elson on March 3, 1944. After WWII, they settled near his home in Beaver Falls, Pennsylvania. After 14 years of marriage, she gave birth to her beloved daughter, Peggy. She devoted her life to the Lord and to her family. They retired to Little River, South Carolina in 1982. 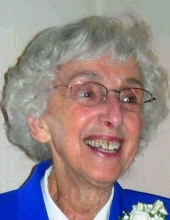 Her hobbies included golfing, bowling, ball room dancing and painting. She was a member of Little River United Methodist Church where she sang in the choir, and in recent years she attended Sardinia Presbyterian Church. She is survived by a daughter, Margaret Letha Elson “Peggy” Chiappetta (Gregory) of Gable; a sister, Ora Gipe Huth of Berkeley, California; a niece, Carole Huth Amberg (John) of Calabasas, California; and two great nephews. A memorial service will be held at 6 p.m. on Wednesday, February 6, 2019, at Sardinia Presbyterian Church with the Rev. Robert Jolly officiating. Visitation will be held from 5 to 7 p.m. on Tuesday, February 5, 2019, at Stephens Funeral Home. Memorials may be made to Little River United Methodist Church, 1629 US-17, Little River, SC 29566 or to Sardinia Presbyterian Church, 1386 Garland Road, New Zion, SC 29111. To send flowers or a remembrance gift to the family of Grace Letha Gipe Elson, please visit our Tribute Store. "Email Address" would like to share the life celebration of Grace Letha Gipe Elson. Click on the "link" to go to share a favorite memory or leave a condolence message for the family.